Happy Friday and Happy Beginning of Summer! Summer is definitely the best time of year in the city. With tons of fun events, outdoor dining, fairs, and rooftop bars to enjoy, there are plenty of reasons to celebrate this season! Last weekend, I went with D, my sister, R, and some other friends to Central Park to soak up some sun, read some good old gossip mags, and get some last minute relaxing in before the coming week. And of course D, who is really a little boy at heart…had to consume three different ice cream bars from the park vendors. When he brought back a neon green colored ice pop, I was more than a little alarmed at the color — I don’t recall anything that is neon green in nature. This “key lime” flavor is probably filled with tons of chemical, sugars, and preservatives…not exactly a cool treat that is sweet for your health! So what are some really healthy, and delicious choices for icy treats when the weather gets hot? Here are my picks to satisfy your sweet tooth without breaking the calorie bank! D swears by Haagen Daaz Fat Free sorbets. You can’t go wrong with their mango or strawberry flavors. Both are incredibly fruity and rich – not too icy tasty, which can be a problem with sorbets. Both only have 120 calories per 1/2 cup! 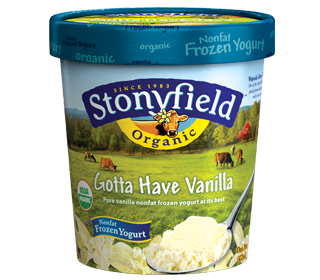 Stonyfield Farm “Gotta Have Vanilla” Frozen Yogurt is DA BOMB. Creamy and delicious, this frozen yogurt is super satisfying and a great addition to smoothies as well! And the most unbelievable part? It’s only 100 calories per 1/2 cup. Breyer’s Fat Free Chocolate Fudge Brownie. Much lower sugar than most ice creams that I looked at, but still a great, chocolatey flavor. I’m drooling just thinking about it! 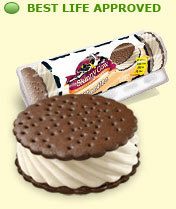 Hands down, Skinny Cow Vanilla ice cream sandwiches are the best thing since sliced bread. Each individual sandwich is 140 calories and 2 g of Fat, and is a great way to practice portion control. And the taste? I actually think it’s better than those bricks of ice cream sandwiches they used to hand out at summer camp! Last but not least is Haagen Dazs Dulce de Leche Frozen Yogurt. It’s a little bit more caloric than the rest of the ice creams at 180 per 1/2 cup. But it is so creamy, rich, and delicious that it really is a treat. The mixture of caramel swirls and vanilla frozen yogurt are to die for, and a little goes a long way towards satisfying any sweet tooth. Those are my picks! What are your fave low-cal icy treats?? Trader Joe’s tart fro-yo is also a delicious treat!